Commuters at Tampa International were hit with a serious dose of puppy love on Friday afternoon. 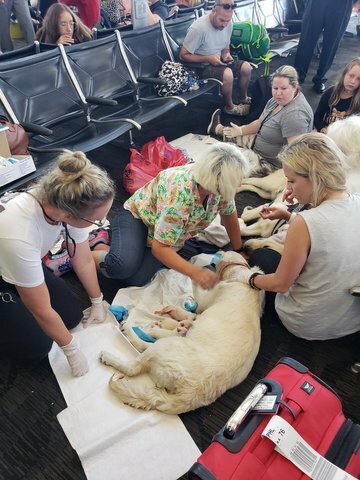 The pup-arazzi was on hand to capture the moment a service dog went into labor while waiting for a flight at Tampa International Airport. Elli, short for Eleanor Rigby, is a 2-year-old Labrador Retriever and service dog. She was waiting to fly to Philadelphia with her owner Diane Vanatter when she went into labor. Tampa Fire Rescue was on hand to help deliver the puppies. The new mom delivered eight puppies -- seven males and one female.